One of our goals is to provide assistance to caregivers who find themselves assisting families who have lost a child. 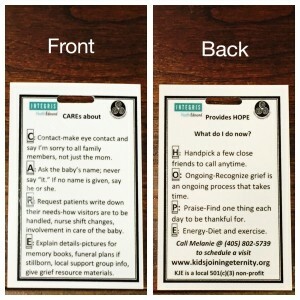 We designed badges we will print, free of charge, that will include your facilities logo and immediate hands-on tips for those nurses, clinicians, etc. on how to do just that. 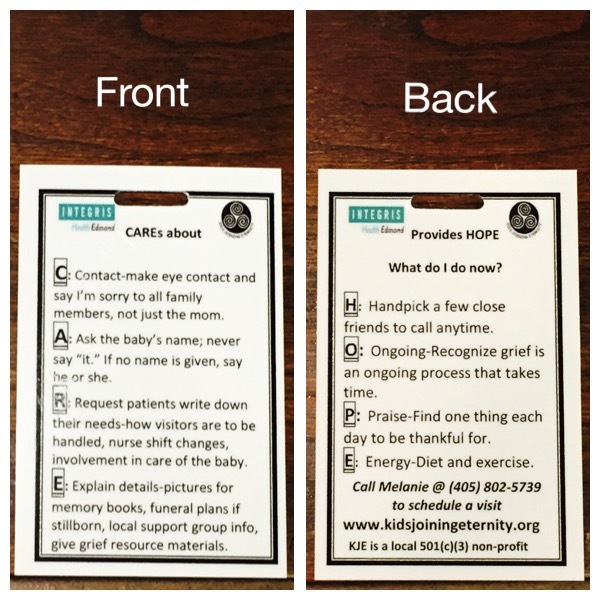 In addition, the badges will include, on the backside, information on how to offer suggestions to your patients on taking that first step to recovering after such a great loss. An example is below of what they would look like. Current recipients of the KJE badges include Mercy, Integris Health Edmond, Integris Baptist, St. Anthony and the Perinatal Center of Oklahoma. Please contact me at melanie@kidsjoiningeternity.org to order some today. Click on the picture to view it bigger.